Part of FCM Recycling’s team on the floor of their e-waste processing facility outside of Montreal. He says the facilities in Delta and Elmsdale, as well as one facility in Cornwall and one in Lavaltrie, all receive and triage e-waste using manual tear-down shops. These facilities are basically preparing materials for FCM's shredder, where they process about six tons per hour. In 2016, FCM processed approximately 29 million kilograms of e-waste, and Rubin expects to see a bit more when they tally up totals for 2017. "In 2017, we're somewhere between 25 and 30,000 metric tons, or about 33 million kilos," he says. "Most of our growth in recent years has come from finding customers and smaller recyclers to service - recyclers that don't have shredding capability, or don't have the throughput necessary to process their customers' goods. This has resulted in a decent boom in volume." FCM's main shredder in Lavaltrie is a 400-hp, low-speed, twin-shaft shredder manufactured by Quebec-based supplier Jecc Mécanique Ltée. Rubin says that compared to large shredders one might find at a scrapyard processing autos and ferrous, theirs is similar but has a smaller hammermill. They also use several smaller shredders on their line, including one from American Pulverizer and one from Shred-Tech. FCM runs material through several shreds, as well as an entire processing line with magnets, eddy currents and induction sorting. One of the largest differentiators from their major competition (which includes eCycle Solutions and GEEP) is that FCM does not engage in refurbishment. "We are solely an end-of-life asset management company," explains Rubin. "So we destroy everything, which means customer data is 100 percent secure. While we know that there's a lot of great software out there that will wipe a hard drive clean, there's nothing more secure than throwing data-containing hardware into a giant shredder." In 2017, FCM processed over 30 million kilograms of e-waste. A second differentiator for Rubin's operation, compared to other major e-waste recyclers, is that in January 2016, FCM Recycling became the first e-waste recycler in Canada to also operate a plastics recycling facility. With an initial investment of over $1 million and an annual capacity of 10 million pounds, FCM Polymers has been mandated to recycle the HIPS (high-impact polystyrene) and ABS (acrylonitrile-butadiene-styrene) generated through the FCM e-waste recycling process. 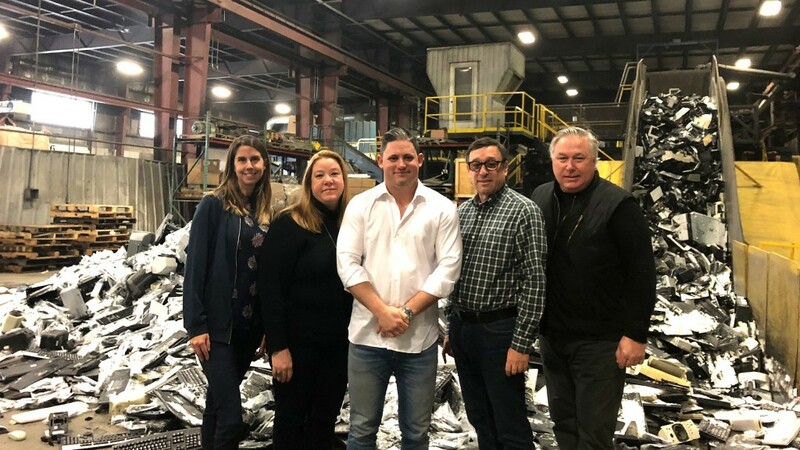 Located at their Cornwall, Ontario facility, FCM Polymers converts plastics recovered and generated from FCM's e-waste processing operations, cleans it, pelletizes it and prepares it for resale into local markets. "Our work in plastics recycling is a couple of years ahead of everybody," says Rubin. "We feel that that's a major differentiator for us from our competition, as our recycling rate is considerably higher because of our ability to domestically handle plastic. Plastics recycling has definitely provided great added value in terms of our revenue stream, and it also significantly reduces our carbon footprint. Where plastic would generally be loaded into a container and sent, often up to 7,000 kilometres away to China, we're able to receive it, treat it, upgrade it and put it back into the material stream right here in North America." Rubin adds that it's also been easier from a logistics standpoint, in terms of not having to find another recycler for the waste plastic they receive and produce through their e-waste recycling process. Though, he qualifies, "At the end of the day, once we process plastics, though we do have a finished good, we still have to find a home for it. It goes back into the manufacturing industry, and it still equates to us working with downstream customers to get the mechanical properties of the material to their satisfaction so they can use it in their process. In terms of selling the final product, it's made it a little bit harder because we went from a standard, commoditized product, where there was an established market for it and it was exchanged with relative ease, to a more customized product for our customer." As with all e-waste recyclers, Rubin says the most valuable products they produce are generally the printed circuit boards and insulated copper and precious metal mix. They also produce steel and aluminum, which are good value items but, he says, plastics has become a very important stream for them, now representing up to 30 percent of their total weight produced. "As electronics evolve there's more and more plastics in them. When I first started in this industry plastics represented maybe 15 to 20 percent of the average material stream. Today it's upwards of 35 percent. And it's weight-based, so if you consider how much less the bulk density of plastic is versus steel, you can only imagine how much it represents in terms of volume." Rubin anticipates others in the industry will follow their model of being an e-waste recycler that also processes waste plastics. He adds that after a year of being immersed in the plastics recycling side of things FCM is now in a position where they have a customer base, regular buyers, and they know exactly what customers are looking for in terms of what type of criteria they need. "It's going well," he says. "Plastics recycling of course has its challenges. Because it is commoditized - it follows the prices of natural gas and oil." With respect to tightening import requirements imposed on plastics and other recyclables in China, Rubin looks at it as an interesting opportunity. "There is now more plastic material available domestically and it's allowed us to source good bead stock, beyond what we generate ourselves," he says. He does also admit that China's new import restrictions present a significant challenge to the industry, as the current policy is not only affecting plastic, but a lot of metals and a lot of other material, post-shred, that was previously export product. "It's injured the market somewhat, but we're hoping things are straightened out relatively soon, or at the very least we see the development of more robust domestic markets for materials." According to Rubin, when the e-waste business started in Canada it was mostly based on a producer responsibility model. The bulk of the volume came from old CRT-TVs, which were really difficult to handle and were mostly dropped off at eco-centres. As the model shifted toward smaller, more affordable items that weigh less because of volumes, he says it opened the door to put more collection bins in more accessible areas. He emphasizes though that the two biggest changes in e-waste have been items getting smaller and lighter. "There are less CRT-TVs, and more and more portable devices," Rubin says. "This has also meant more lithium-ion batteries, which are a serious fire hazard, and which means they require much more manual manipulation." Because every good is so different from the next, he adds that it's proven to be a challenge to find technology that can safely remove batteries from e-waste in an automated fashion. FCM is still removing batteries manually. "Right now, seeing as this change toward lithium-ion batteries came on quickly, we do it by hand. We inspect each good and manually pull out the batteries, though we have explored a couple of automated technologies. "From my understanding, and our discussions with others, I don't see that anyone has come up with a real automated solution to getting batteries out of e-waste, but we have our fingers crossed that where there's a problem and a will, there might be a way." Beyond the challenge of extracting batteries from e-waste, Rubin says the existing sorting technologies for electronic waste that are currently used have been around for several years, most of them borrowed from the auto shredding industry, including induction sorting, near-infrared sorting and optical sorting. "There hasn't been a major technological advance in e-waste sorting equipment in the last few years. There's been a lot of focus on plastic sorting though, so we're hoping new technology comes soon, which will make our job a little bit easier." Still, he does fully expect that AI technology will become a prominent part of their business within the next decade or so. "We do believe that one of the hardest and most complicated parts of our business is triaging materials, or sorting it, because there's so many different printers, so many different faxes, so many different computers," he says. "Eventually we're going to get to a point where there's a comprehensive database of these items, and a high resolution camera that will allow a machine to do the triage work." Rubin emphasizes that to FCM and its customers, the responsible recycling of e-waste is a very important factor. He says there's two key elements to it. "Number one, our customers need to be sure that their data is being handled safely," he says. "Let's face it, in today's world there's a lot of information on a hard drive, a printer, a photocopier, and it really needs to be dealt with. For us, the safest way to handle that data is to put it in a shredder, leaving zero ability to reconstruct that hard drive or printer or fax machine. "Number two, we need to keep as high of a landfill diversion rate as possible, which allows our customers to go back to their shareholders and stakeholders and show what impact they're having on the environment." Currently, he says they have a 99.2 percent diversion rate, and the way they work with customers is that the higher the recycling rate they can provide, the higher the compensation. "So we guarantee them a certain recycling rate, and if we're able to exceed that, there's a bonus to it." He says they also produce CO2 reports, which are basically emission offset reports that customers can show to their stakeholders, detailing how many tons of carbon they've saved from the atmosphere by having their goods recycled. "Right now, unfortunately, there's no legal requirement for companies to make sure their end-of-life goods are properly handled and safely disposed," he says. "We operate under the hopes that good samaritans, which there are many out there, will choose the green option, not the cheapest option, ensuring that their data is protected and that as much material as possible is diverted from landfill. "When material comes to us, we're not just harvesting what's valuable and landfilling the rest. We're properly dealing with the mercury that's coming in scanner-based devices and batteries are being properly treated. Leaded glass from old CRT-TVs is also being properly disposed of and handled. "When we receive goods and we promise destruction, we issue a certification of destruction, putting our reputation on the line that it is destroyed. And we are absolutely legally liable in the event of a breach. As are all recyclers treating sensitive data." With respect to the illegal overseas dumping of e-waste Rubin says this issue is a tough one, but not one that he sees as a common occurrence in Canada. He says that once certifications are achieved there is a compensation scheme managed by the EPRA (Electronics Product Recycling Association) which allows for payment to properly process e-waste. "The people that we deal with are all on the level, and therefore are not exporting any waste illegally," he says. Rubin explains how they undergo very rigorous audits to the R2 standard as well as the Canadian standard known as RQP (Recycler Qualification Program). FCM is audited through a quarterly mass balancing and is required to account for any materials that come in, show where it went, and is subject to surprise audits as well as health and safety audits. FCM is also ISO 9001, 14001, 18001 certified, as are most Canadian recyclers, according to Rubin. When it comes to tracing materials once they leave FCM, Rubin says that it's a question of knowing which companies materials are going to and that those companies are all certified. "We conduct an on-site audit for every company where we're sending goods," he says. "So we're able to track those materials all the way through to final disposition, and we have to have an R2 approval and an RQO (RQP) approval to use a downstream processor. So they're vetted quite heavily." In Canada, the Electronic Products Recycling Association (EPRA), a not-for-profit organization based out of Mississauga, Ontario, is responsible for managing government-approved programs that are established by manufacturers, retailers and other stakeholders to collect and responsibly recycle end-of-life electronics. "The EPRA has done a really great job in harmonizing the market, making it fluid across the all the provinces, so recyclers know what to expect, and can have proper treatment schemes in place," Rubin says. He adds though that the EPRA has been a little bit limited in some provinces. Ontario is an example. When it comes to e-scrap, Rubin refers to the provincial climate there as a free market where private companies can collect directly from consumers and they are only allowed to service other businesses. "A lot of businesses have popped up trying to make money by buying e-scrap from the public and then brokering it over to electronic recyclers who then apply for a tipping fee to Ontario Electronic Stewardship," he explains. "The problem is that electronic waste inherently has a negative intrinsic value. So unlike a car where you can take what's valuable and get rid of the rest, we have to treat a lot of deleterious elements, a lot of hazardous items at cost. "This means that once a recycler has gone through the whole process of treating electronic waste, it actually costs more to treat it than the value of products generated. So what happens in Ontario, is because you're paying out so much money to get the goods, there's very little margin there for you to actually process the goods." Because of this, FCM considers the Ontario market to be a little bit stalled and it is not a main focus for them. "Plus, we're always competing with landfill," Rubin adds. "So what we feel is needed is a ban on electronics to landfill." He says they would also like to see collection programs expanded in Ontario and in all provinces to encompass a wider range of consumer goods, like in British Columbia, where collection and EPR doesn't stop at electronics. It extends itself all the way into toasters and microwaves, vacuum cleaners and power drills. "That's a huge source of product that needs to be diverted from landfill," he says. "And unfortunately, in most places in Canada, this category of waste is kind of caught up a little bit in the legislative framework. "To add another product to an EPR program means regulators have to open up the legislation, change it, rework things, have a debate, and so it is a slow process." This article was originally published in the January/February edition of Recycling Product News, Volume 26, Number 1. The team at FCM Recycling, (back row, from left to right), André Lauzon, Nicolas Charette, Valérie Cherrier, Andrew Rubin, Nicka Lavallée, Luc Chayer, Jöel Bussière. (Front row, from left to right): Gilles Marcotte, Natalie Lizotte, Karine St-Jean, Mark Busgang and Mahmood Mehrabzadeh.